I’m very excit­ed today to release some­thing to the world on which I’ve spent a great deal of time: a new per­form­ing edi­tion of Anto­nio Vivaldi’s Con­cer­to in G minor for bas­soon, strings, and bas­so con­tin­uo (RV 495), pre­pared using a copy of Vivaldi’s own man­u­script. You can down­load the whole thing (for free!) at the end of this post. But first I’d like to talk a bit about my path to the piece and my meth­ods in cre­at­ing this edi­tion. I hope that this will all prove use­ful to some­one out there, par­tic­u­lar­ly since this is one of the required pieces for the 2014 Meg Quigley Vival­di Com­pe­ti­tion. I’ve played a cou­ple of Vivaldi’s oth­er con­cer­ti in the past. But my rela­tion­ship with this piece began last year, after Nad­i­na Mack­ie Jack­son did me the hon­or of ask­ing me to write the lin­er notes for the first disc in what will even­tu­al­ly be a set of all the Vival­di bas­soon con­cer­ti. I dove into the project with my cus­tom­ary gus­to — books lit­tered my desk and floor, and PDFs of mis­cel­la­neous Vival­diana deliv­ered to me by the wiz­ards of Inter­li­brary Loan sim­i­lar­ly clut­tered my lap­top screen. As far as I’m con­cerned, research is the fun part. If I could just keep find­ing and absorb­ing more sources with­out ever hav­ing to actu­al­ly write any­thing, I’d be that much hap­pi­er. But aside from the var­i­ous print mate­ri­als, I had a more-or-less con­stant Vival­di bas­soon con­cer­to sound­track — most­ly pre-release mix­es of Nadina’s record­ing, but also ver­sions by Michael McCraw, Ser­gio Azzoli­ni, Mau­rice Allard, and oth­ers. By the time I had fin­ished the notes for Nad­i­na, I was thor­ough­ly fired-up about Vival­di and his 37 bas­soon con­cer­ti (plus two incom­plete works). So much so, in fact, that I asked Lor­na Peters, Sacra­men­to State’s won­der­ful harp­si­chord (and piano) teacher, if she’d con­sid­er pro­gram­ming one of them with Cam­er­a­ta Capis­tra­no, the school’s Baroque ensem­ble. Hap­pi­ly for me, she agreed, and I set about pick­ing a piece. It’s prob­a­bly not sur­pris­ing that I chose one of the con­cer­ti from Nadina’s disc (RV 495), with which I’d been singing along for weeks. There are many things I love about this con­cer­to. The first move­ment is fiery and flashy. The sec­ond move­ment fore­gos the upper strings entire­ly, cre­at­ing a beau­ti­ful and pas­sion­ate dia­log between soloist and con­tin­uo. The third move­ment is just all-out inten­si­ty — it starts with the whole ensem­ble in dri­ving uni­son (almost the Baroque equiv­a­lent of pow­er chords), and con­tains what I think is one of the best licks ever writ­ten for bas­soon (mm. 53–56). I first per­formed the piece with Cam­er­a­ta Capis­tra­no in Feb­ru­ary of this year, and luck­i­ly we’ve had many chances to present it again since then. Our tenth per­for­mance will come this Sun­day, as part of the Bra­vo Bach Fes­ti­val in Sacra­men­to. This is the first time I’ve per­formed a sin­gle solo work so often, and I’ve found it to be an incred­i­bly instruc­tive and free­ing expe­ri­ence. The abil­i­ty to actu­al­ly take chances and try new things over the course of mul­ti­ple per­for­mances can shape your per­cep­tion of and rela­tion­ship to a piece in ways that are dif­fi­cult — if not impos­si­ble — to recre­ate in the prac­tice room or in a stand-alone per­for­mance. Even though I fin­ished school a num­ber of years ago, the one-and-done degree recital men­tal­i­ty is some­thing I’m still try­ing to shake. But that’s a top­ic for anoth­er post. As soon as I’d set­tled on this con­cer­to, I knew that I want­ed to cre­ate my own per­form­ing edi­tion. At the time, I couldn’t locate an edi­tion with string parts (I’ve since found one, avail­able only from Ger­many). Plus, what bet­ter way to learn a piece back­wards and for­wards than to study the man­u­script and make up a new score and set of parts? I could eas­i­ly have used as my source the score pub­lished in 1957 as part of Ricordi’s Com­plete Works edi­tion. But the edi­tor, Gian Francesco Malip­iero, pro­vid­ed no crit­i­cal com­men­tary and appears to have made some edi­to­r­i­al deci­sions with­out explic­it­ly indi­cat­ing that he’d done so. So instead, I went right to Vivaldi’s own man­u­script. Vivaldi’s bas­soon con­cer­ti (and indeed most of his works) were not pub­lished in his own life­time, and are only known to us through a mas­sive col­lec­tion of man­u­script scores that now resides at the Bib­liote­ca Nazionale in Turin, Italy. 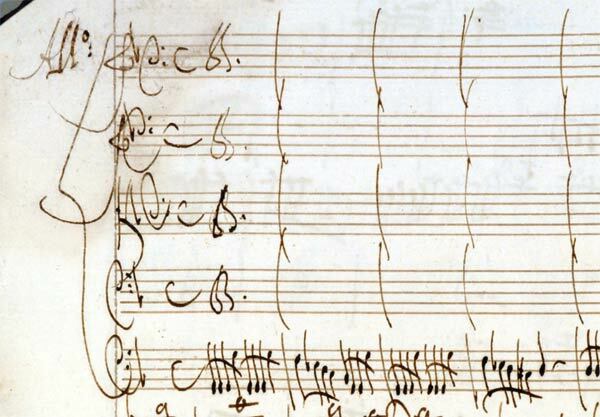 Most of these are in the composer’s own hand, and the col­lec­tion con­tains many incom­plete sketch­es and drafts. These are strong indi­ca­tions that the col­lec­tion was Vivaldi’s own com­pendi­um of his works, and as such, the scores are far from per­for­mance-ready. The com­pos­er made exten­sive use of short­hand tech­niques, includ­ing dal seg­ni that would be awk­ward in per­for­mance and sim­ply indi­cat­ing uni­son parts instead of writ­ing out the same music on mul­ti­ple lines (see the exam­ple at right). Through­out the con­cer­to, Vival­di indi­cates that the soloist should join the con­tin­uo line dur­ing tut­ti sec­tions. Except for the few pas­sages in which Vival­di did not make such an indi­ca­tion, I have pro­vid­ed the soloist with the bass line in small nota­tion. The Ricor­di score leaves rests for the bas­soon in all of these pas­sages. Mea­sures 211–214 of the Presto are in D minor in Vivaldi’s man­u­script. In mea­sure 211 it appears that he has writ­ten and then wiped away or scratched out a sharp sym­bol on an F in the Vio­la part, but there are no oth­er F-sharps marked in those mea­sures. There is then a sud­den change to D major in mea­sure 215. 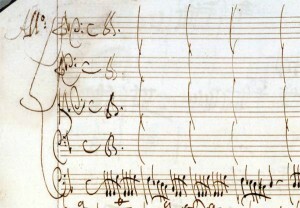 The Ricor­di score places the whole pas­sage in D major. Mea­sure 260 of the Presto does not exist in the Ricor­di edi­tion. This comes at the end of the last solo sec­tion, and the final ritor­nel­lo is a repeat of mea­sures 23–55. In Vivaldi’s man­u­script, he wrote out a full mea­sure of res­o­lu­tion (my bar 260), and then indi­cat­ed a dal seg­no to mea­sure 23. Ricor­di omit­ted this mea­sure, and instead elid­ed the last solo cadence with the begin­ning of the final ritor­nel­lo. Vival­di wrote artic­u­la­tion marks over the eighth notes in the solo part in mea­sures 249–252 and 258–259. The Ricor­di edi­tion ren­ders all of these marks as stac­cati. 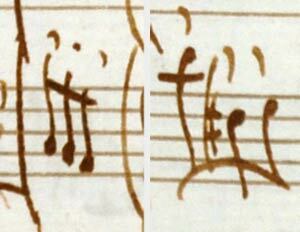 But in Vivaldi’s hand, the marks in mea­sures 258–259 are clear­ly longer than those in 249–252 (see below). Thus, I have marked the eighth notes in 249–252 as stac­ca­to and those in 258–259 with wedges. For the actu­al engrav­ing of the score and parts, I used Lily­Pond, which I also used for my fin­ger­ing charts. It can be kind of a has­sle but pro­duces very ele­gant results. Also like my fin­ger­ing charts, I’m releas­ing this under a Cre­ative Com­mons Attri­bu­tion-Non­Com­mer­cial-Share­Alike license. Basi­cal­ly, it means you can use, alter, copy, or dis­trib­ute this how­ev­er you’d like, so long as you give me cred­it and don’t sell it. It is impor­tant to note that this edi­tion does not include a key­board reduc­tion. It is suit­able only for study or for per­for­mance with string play­ers and a com­pe­tent harp­si­chordist. If you need a ful­ly writ­ten-out key­board part, I would rec­om­mend the new bassoon/piano edi­tion pub­lished by TrevCo Music Pub­lish­ing (they list it under its Fan­na num­ber: F8#23). Although I’ve gone over all of this with a num­ber of fine-tooth combs, I’d wel­come any cor­rec­tions, com­ments, or oth­er feed­back.